Modern Designer bach - full wood interior with built in furniture makes this bach the perfect relaxing holiday house - complete with all mod cons. Kitchen is modern and fully equipped with quality crockery/glassware - including a Nespesso Machine. 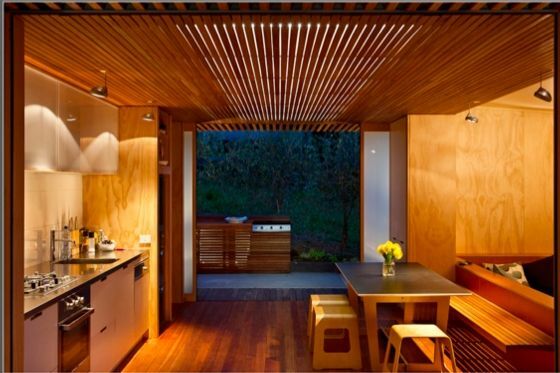 Situated in one of the most beautiful parts of New Zealand, the Coromandel. Onemana is a stunning white sand beach with surf, tennis courts, playground for kids, and a cafe. It is a beautiful quite spot 10 minutes drive from Whangamata, (also a white sand surf beach) where there are shops, movie theatre, supermarket, petrol station, and cafes. There is many beach/bush walks in the surrounding area. 3 Single built in bunks in second room - which has own tv/DVD and Childrens toys and games. Bathroom has access from straight off the deck. Whole house opens up for the ultimate indoor/outdoor flow - with chilling areas out both sides so you can capture the sun or relax in the shade depending on time of day. With Awesome private BBQ area out the back of house. Quality Linen/towels are available - see below. There is no driveway at this property - 4WD can drive up section and park by house - Safe parking is available on the road. Absolutely loved our stay in this beautiful, well designed and peaceful bach. Onemana beach is a stunning spot. The bach has everything you need and nothing you don’t. Beautifully designed and appointed. We haven’t felt so relaxed in a very long time - thank you for sharing your slice of paradise! We really enjoyed our stay. The house is well set up and has everything you need for a relaxing stay. Lovely bach, perfect for relaxing. Lovely bach, perfect for relaxing. Thanks. We really loved our stay at this bach! We really loved our stay at this bach! There are some quirks - such as the main entry being through the bathroom - but then there are so many great things that make up for these little oddities. Loved the lounge area, the deck etc. So you're not disappointed - there is no view, but it is a really short walk to the beach. Great location. You can not drive up to the property and there's a relatively steep walk on lawn so if you have mobility issues this probably isn't a good option for you. We absolutely loved your place, it was perfect for relaxing. We absolutely loved your place, it was perfect for relaxing. Onemana and your bach inspired us to get trun away and get to the beach more often. Thank you Shiree and Lynda. We will be back. Our stay at Onemana Batch was perfect. Our stay at Onemana Batch was perfect. It's such a fantastic house to relax in and enjoy the surroundings. The batch is really comfortable, clean and very well architecturally designed. Onemana is a quiet little town which is just what we wanted for our holiday. The beautiful beach is just a short walk away and great cafes and restaurants are just a 10 min drive away.